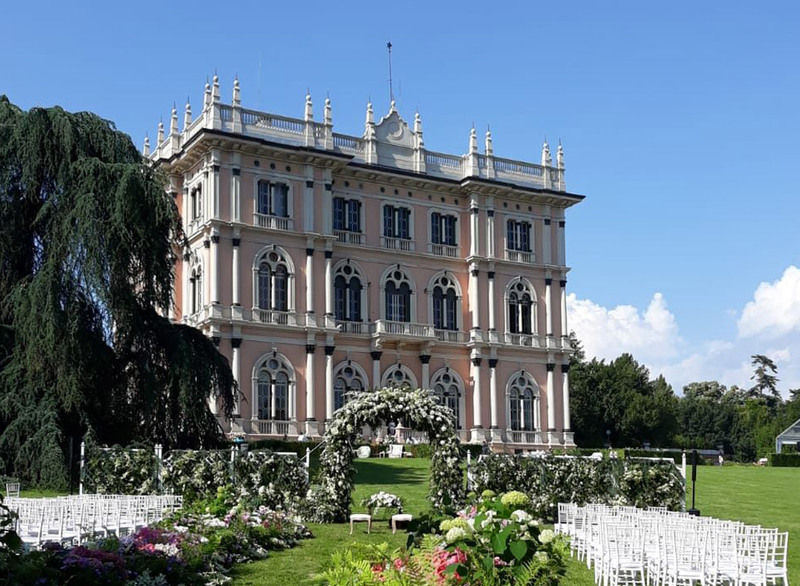 A clear sky and crystalline light which illuminated the park and our facilities further enhanced the beauty of a wedding which for many was an occasion for discovering the fascinating Ville Ponti. Daniele Bossari and Filippa Lagerbäck were joined in matrimony right here on June 1st. The flower arch on the lawn was made especially for the occasion, under the meticulous direction of the wedding planner Enzo Miccio. The sun was shining and the pink hues of Villa Andrea provided the perfect backdrop for the thrilling moment the couple said “I do”. The beauty of the spouses and the elegance of our villa charmed all the guests which included many a familiar face from the world of national and international entertainment. The parterre in front of the entrance to Villa Andrea was transformed into a maze of hedges and antique furnishings, in a deliberate allusion to “Alice in Wonderland”, as desired by the bride. The candle lit dinner, which took place in the frescoed halls on the ground floor, was enriched by floral table cloths and golden chairs. The magic continued in the park, with a magnificent seven tier cake by Ernst Knam, followed by fireworks and music by the band Nick the Nightfly which entertained guests through the night. The spouses described it as “the perfect day” and we are delighted to have been involved.